Are you concerned about people seeing what you chat about on the web? Are you concerned that big brother might be watching you chat with your friends about that pillow fight you had earlier? Well then you need Cryptocat secure chat client. This chat client encrypts all chats to make all things private and secure. It also integrates nicely with Rich Notifications to let you know when someone is chatting you up even when the window is minimized. Get Cryptocat from the Chrome Webstore! 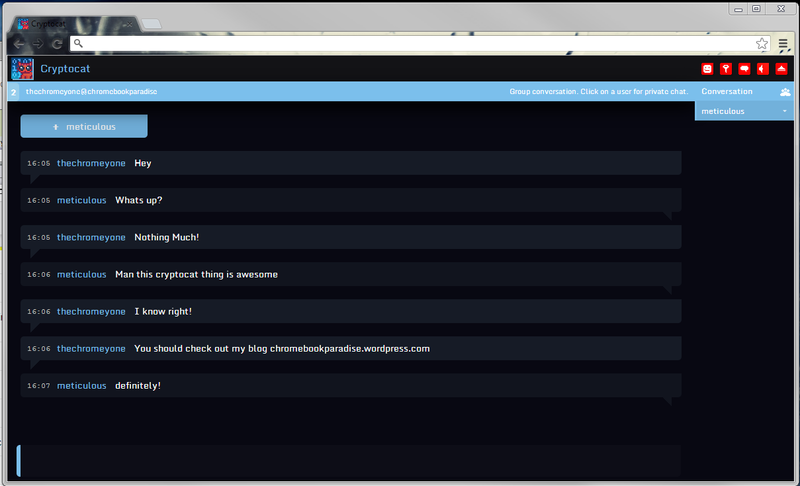 Wanna chat me up join my conversation on Cryptocat conversation name: chromebookparadise once you have installed it. Screenshot of Cryptocat in action. This entry was posted in ARM Chromebook, Chromebook, Software Tips, Tips and Tricks and tagged Arts, chromebook, google, Google Chrome OS, Instant messaging, Programs, Reality-Based, samsung, Television, tips and tricks by James Arnett. Bookmark the permalink.